Here at luxamart Jewelry Exchange in frisco,TX we buy and sell all types of coins and currencies. We have some of the best prices in Texas and would love to show you or help you add to our collection. There are a lot of claims and suggestions made every day about rare coin investments and how much they’ll increase in value. An impressive assortment of studies shows greater financial returns from rare coins than almost any other type of investment over a period of time. But, as with all studies, like those of the stock market, price increases and profits depend on the coins or stocks used in the survey. Tread carefully here, because coins are volatile, and depending upon the individual coins, they can make price comparisons look awfully good and sometimes not very good at all. Successful collectors know that focusing on investment potential means really missing out on the fun, history, education and satisfaction that make coin collecting so enjoyable. Actor Buddy Ebsen, known for his role as Jed Clampett on The Beverly Hillbillies, was a noted coin collector. One of Ebsen’s favorite coins was one with a number of nicks on it. Each nick would decrease the value of that coin, but he did not care. He explained that behind each nick was a story that he did not know, but which would lead him to imagine how that nick had been received. As the coin was a Territorial $50 octagonal slug from the gold rush days in California, there were a lot of potential stories that he could make up to explain the damage to it. Ebsen had discovered one of the frequently overlooked secrets to enjoying his coins: He had found that learning the history of your coins makes them virtually come alive. Studying the history of your coins can make a seemingly ordinary 1864 two cent piece come to life as the first coin to bear the motto In God We Trust, while a 1944 nickel with a special composition becomes a souvenir of World War II, just as a Carson City Morgan dollar can be a souvenir of the Old West. Knowing such information makes any coin more than an investment or just part of a collection – it makes it an actual piece of the history of the country and its struggles and triumphs. Buying coins you enjoy, and methodically building a collection over time, brings a reward that is priceless. Every time you examine a coin in your collection, it will bring a smile to your face, and a warm feeling to your heart. After you’ve bought several coins that strike your fancy, whether for design, history, or quality, a careful, reflective review of your purchases will uncover patterns that reveal areas of interest, or hopefully fascination. You have an idea of what you like – what excites you. That’s the time to consider setting a few immediate collecting goals, which you can always add to or revise later. Specific collecting goals not only give you direction, but also ensure utter satisfaction when you find that perfect coin. Everyone has different reasons for collecting coins, and different experiences in assembling a personal collection. The one constant found in the hobby is the challenge of assembling a top-quality collection. For some, the greater the degree of challenge, the happier they are! It is not that much fun if you can immediately fill your want list. Spending five, ten, twenty years or even a lifetime building a collection is part of the fun. Whether you pursue quality or quantity, determine what makes you happy and stick with it. 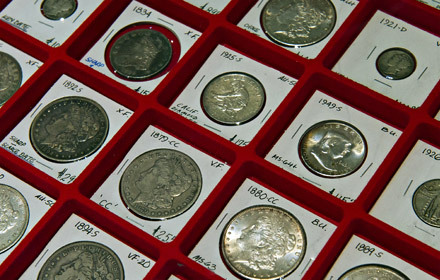 Are you after a complete date and mint mark collection of Morgan dollars? Or do you want to build a U.S. type coin collection? Perhaps Lincoln cents strike your fancy. The options are many and no option is right or wrong. In coin collecting, the correct collection is the one which is interesting to you. Define your goals and you’ll likely multiply your enjoyment of the hobby tenfold. Browse coin catalogs, websites, subscribe to coin collecting magazines, get a copy of The Official Red Book by Whitman Publishing, join the American Numismatic Association (www.money.org). Most reputable companies, like Littleton Coin Company, can assist you in defining your goals and provide all the numismatic and historical information you need. A great place to start is by downloading Littleton’s How to Collect Coins booklet FREE at LittletonCoin.com under our Learn Center, “How to Collect…” booklets. Once you have decided on what you are going to collect, the fun really begins. Now you can start to hunt for coins to add to your collection. There are, however, some things you should understand about rare coins and their prices before making your purchases. The first thing is that rarity is relative. It is called the rare coin market and in virtually every case, the coins you’ll purchase are rare relative to the coins in your pocket. Even if a coin is legitimately tougher than most other older ones, that does not by definition make it valuable. Rarity is certainly a factor, but so is the demand for the coin in question, and there are many examples which are more expensive or less expensive than their rarity might suggest. The 1950-D Jefferson nickel is a good example. The 1950-D had the lowest mintage of any Jefferson in history and that, by definition, should make it rare. Compared to the nickel in your pocket or many Jefferson nickels of the past, the 1950-D is valuable. But at the time it was issued it was heavily hoarded, as collectors and dealers back then figured the mintage made the 1950-D a coin likely to move to much higher prices. It did, but today we find that in top grades the 1950-D is less expensive than some other Jeffersons, like the 1939-D, 1939-S and 1942-D simply because hoarding meant that the supply in top grade is greater than mintage would suggest. Another classic example is the 1909-S VDB Lincoln. With 484,000 minted, it is far more available than lower-mintage coins, such as an 1844 or 1845 silver dollar (mintage 20,000 and 24,500 respectively), yet the 1909-S VDB is more costly in most grades. The reason is there is a much greater demand for this enormously popular issue. And, due to this demand, there simply are never enough examples for everyone who wants one. There is probably no better illustration of demand creating higher prices than the famous 1893-S Morgan dollar. The 1893-S with a mintage of 100,000 was certainly going to be a better date. In this case, demand for the 1893-S makes a great deal of difference in its price. The 1893-S, for example, is much more common than the 1860-D gold dollar, which had a mintage of just over 1,500 pieces, but there is far greater demand from collectors for the 1893-S Morgan. As a result, it is usually as expensive as, or even more so than the 1860-D gold dollar, simply because of that demand. It is even true when you compare the 1893-S to other Morgan dollars. The 1885-CC is actually tougher than the 1893-S in some circulated grades, however, the 1885-CC can be found in considerable quantities in Mint State, so collectors needing it often acquire a Mint State coin. Such an option does not exist for the 1893-S, and the constant demand makes it more expensive in circulated grades than the 1885-CC. Once you have determined the coin you might want to purchase, a number of other factors, in addition to its rarity and price, come into play. The most important is being sure that the coin you are purchasing is genuine. While professional coin dealers of America have taken strong steps to guarantee that they are selling only genuine coins, it is an unfortunate fact that other new threats in terms of the sale of fake coins have emerged. One area to be extra cautious of is the Internet. Many coins are sold simply “as is” and sometimes that means fake. Protect yourself by working only with well established, respectable companies that can prove years of satisfied customers served. You should also check on the reputation of the dealer with other dealers, collectors and professional organizations. One of the organizations you can ask is the American Numismatic Association to be sure that your dealer is a member in good standing. There are other professional groups, such as the Professional Numismatists Guild. Any dealer should be willing and able to furnish you with references. Do your homework on them; make them earn your trust. When it is time to sell, thousands of collectors find disappointment when they discover the Extra Fine gold coin they purchased is actually considered Very Fine by the purchasing dealer. How to avoid that? Work only with the most selective of dealers. And remember that the grade given by a reliable grading service or dealer is really just the starting point toward the price. Other factors come into play, such as strike and eye appeal. Whether it’s the grade or other factors, the best way to double check on what the dealer says is for you to be informed. That means you should study and practice grading yourself, and educate yourself about grading services. Rating the grading practices of any dealer or even grading services is difficult. Both Professional Coin Grading Service and Numismatic Guarantee Corporation were rated as”superior” by Professional Numismatists Guild and the Industry Council for Tangible Assets. Since the advent of grading services in 1986, the hobby has been doing everything possible to make grading uniform, and the rare coin buyer today is much more secure that their purchase is correctly graded if it has been certified by a reliable third-party grading service. Clearly, while grading service packaging is helpful in most cases, the smart buyer wants a reliable dealer to stand behind the coin they are buying, whether or not it has been graded by a third party. If the coin is sold by a dealer and not a grading service or organization, and you are unsatisfied, it is the dealer with whom you must reach a settlement. This means that not only your best choice, but basically your only choice for security is to buy from reliable, professional dealers with years of experience. As mentioned, there are still numerous other factors beyond the technical grade of a coin that influence its price, and they vary with every individual piece. An 1891-O Morgan dollar is a good example, as it is sometimes found with a nice sharp strike and good detail. More often, however, the strike is weak and the detail is not sharp, yet two very different looking coins could receive the same grade but be valued much differently. In other cases, such as copper large cents, the quality of the planchet can vary greatly and that, too, is not factored into the technical grade. If, for example, you find the key 1799 large cent with an attractive blemish-free surface and a pleasing chocolate brown planchet as opposed to the usual dark ones, you are probably going to have to pay a premium price and should be happy doing so, as they are few and far between. To these factors, other important ones can be added, like the quality of the luster, the surface quality, and things such as toning. Silver coins, especially, can turn color over the years, and some colors, such as gray or even black, are seen as a negative factor in pricing, while other colors can be seen as good, adding to the value of a particular coin. Knowing what to expect from a certain coin is something that is learned from years of experience. An 1881-S Morgan dollar is expected to be well struck and nice, while an 1893-CC or 1895-S is likely to have bag marks. Knowing that enables the buyer to determine what is a truly exceptional coin and what is an average one. Littleton Coin Company, like most expert graders, typically rejects 40% of the coins presented for purchase, for not measuring up to their high grading standards and eye appeal requirements. Once you develop trust in a dealer, you want to be sure you can find the coins you want and need from them. There are few if any other firms in America who carry the variety, quality range and depth of inventory that Littleton does. They have the buying power, grading skills and capacity to stock not only the most popular coins on the market but also the rare and one-of-a-kind finds. As a purchaser of some of the largest and most important hoards, like The Midwest MegaHoard, Southern “CC” Cache, Vermont Yankee Hoard, and New York Subway Hoard, Littleton has met the needs of hundreds of thousands of collectors. That’s important for buyers, as their inventory usually has the coin you want, and in the few cases that it doesn’t, they will go out and find it. Sometimes a coin will disappoint you. Steer clear of any company not willing to offer anything less than a full money back guarantee. Don’t be shy about demanding a money back guarantee for any reason. Today’s consumers are used to companies serving them, and the coin collecting industry has to keep up. At the minimum, expect a 30-day guarantee. Littleton offers a full 45-day money back guarantee, should you choose to return a coin for any reason. Buying through the mail is safe and easy, and enjoyed by millions of collectors. Not only is it exciting to receive a new and colorful catalog, but WOW! – what a thrill when your coin shipment arrives in your mailbox! Again, work with companies that offer full guarantees, have outstanding grading standards, and (very important!) guarantee delivery. Shopping by catalog or websites is as safe as buying at shops, shows and auctions when you are working with reputable companies. Remember… the more choices you have, the better ones you’ll make. Nothing can be more disappointing than discovering that the value of your coins has decreased due to improper storage. So, educate yourself about all the options available to you. Albums, folders, presentation cases – there are hundreds of options. Always look for acid-free materials that are archival safe and proven to minimize the natural effect the environment can have on your coins. Littleton Coin Company offers an extensive line of products – all archival quality. Nothing takes you back in time better than holding a genuine piece of history in your hand. What could be more historic than a 1943 Lincoln cent made of a special alloy of zinc-coated steel? The 1943 Lincoln cent did not look or weigh the same as a normal Lincoln cent for a very simple reason: we were in the middle of World War II and the United States needed to conserve its supply of copper for war use. As a result, the unusual steel alloy was used only for the cents of 1943, making them not only interesting dates for a Lincoln cent collector, but actual souvenirs of the sacrifices needed to win the greatest conflict in history. Certainly, that makes the 1943 cent a special coin with a special place in history. Or you could have a well-worn 1794 large cent which you could imagine was possibly in the pocket of George Washington at one time, or a later 1861 Indian Head cent that could have been carried into battle by a soldier in the Civil War. The options and possibilities are many, and they are all part of what makes coin collecting so much fun. I strongly urge you to follow these 10 insider tips so that you can focus the majority of your attention on the thrill of the hunt and less on avoiding the pitfalls. In summary, have fun, be safe, and allow yourself to be swept away by this fascinating and utterly satisfying pastime. Come in to luxamart today for the greatest value for your jewelry needs! We buy, sell and repair and clean diamond rings, gold, silver, platinum and coins and coin collectors. Staying up to date on technology and industry trends we provide amazing services. We also sell and buy and repair luxury watches, Engagement rings, necklaces and much more. We are located in booming frisco, TX at Lebanon and Preston Rd.